From the 1880s to the end of World War I, the fashionable resort of Bar Harbor attracted thousands of summer visitors with the money and leisure to pursue "the simple life on a grand scale," as A. Atwater Kent put it. They came to rusticate, dance, sail, picnic, flirt--and they did it all with style. Many relaxed at Bar Harbor's lavish hotels, while others built even more lavish and fanciful "cottages" for their own summer retreats. That dazzling era is just a memory now. The Depression and World War II undermined the summer colony, and the Great Fire of 1947 dealt the final blow. Those summer homes and hotels that survived the blaze generally succumbed to changing times, and only a handful stand today. 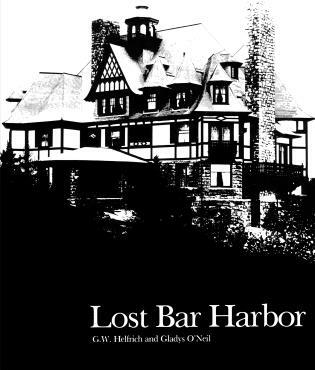 Eighty-six vanished summer palaces are pictured in Lost Bar Harbor. Many never before published photographs from the Bar Harbor Historical Society are supplemented by lively text describing the estates and their colorful inhabitants. It is the most comprehensive collection of early Bar Harbor photographs ever assembled, providing an unparalleled glimpse of one of the world's great resort communities.